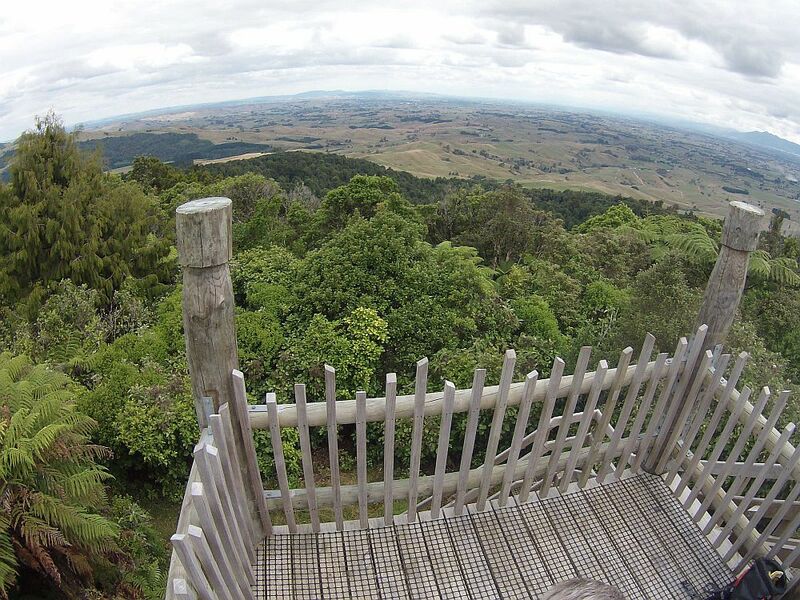 The Te Tapui Scenic Reserve includes the two peaks of Te Tapui at 492m and Maungakawa at 495m. 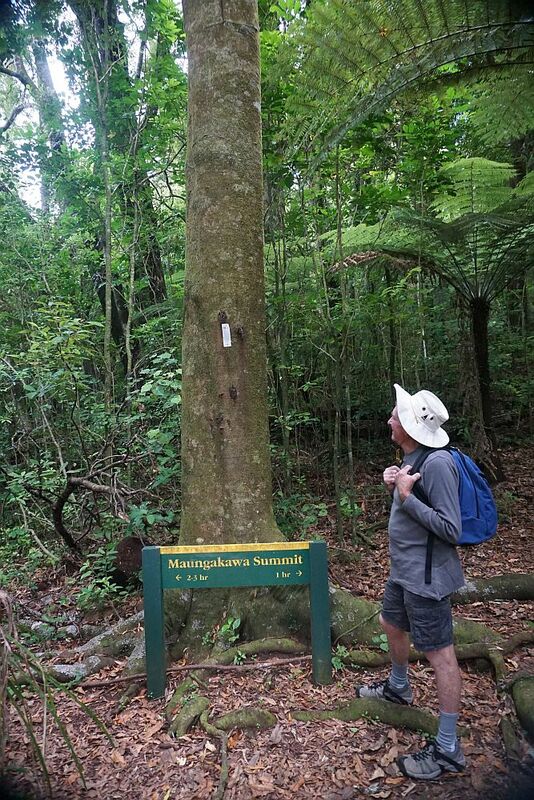 The Te Tapui Loop Track to the summit of Maungakawa starts at Piakonui Rd, west of Matamata, northeast of Cambridge and southeast of Morrinsville. It can be walked in a clockwise or anticlockwise direction, although the DoC description recommends the anticlockwise direction. However, the times and distances on the DoC site do not entirely agree with my experience. The distance is close to 6.5km measured by GPS instead of 4km, and the time of 3 hours should be ample even with a long break at the summit. Piakonui Rd is mostly a narrow gravel road, but slightly better from the northern end than the southern end. There is a parking area at the start of the track, but no toilet facilities anywhere on the walk. 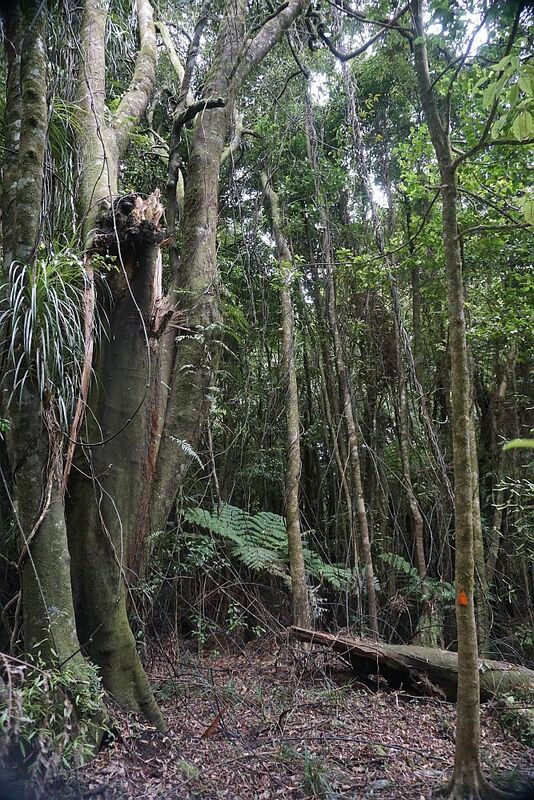 Walking the loop anticlockwise gives a fairly direct and not very steep route to the summit, on a well-marked track on forest floor, with numerous exposed tree roots. The distance is about 3km, and took about 1h 10m to walk. Total climb is from about 130m to the summit at 495m. The downward section of the track is very similar to the upward, but slightly longer at about 3.5km, and has some short uphill parts as well as downhill. Total time was almost 1h 10m, or about the same as the ascent. 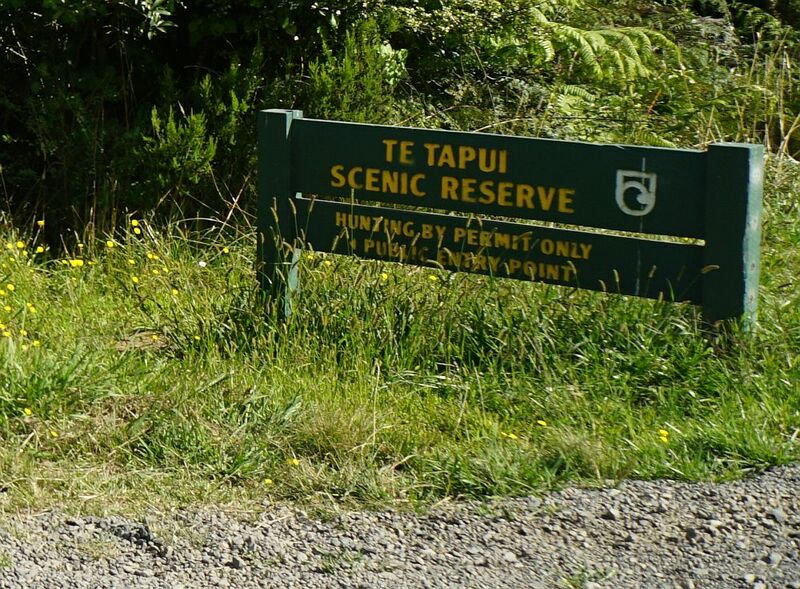 The sign on Piakonui Rd marking the entry to the track. The parking area on Piakonui Rd, with the track start between the two vehicles. 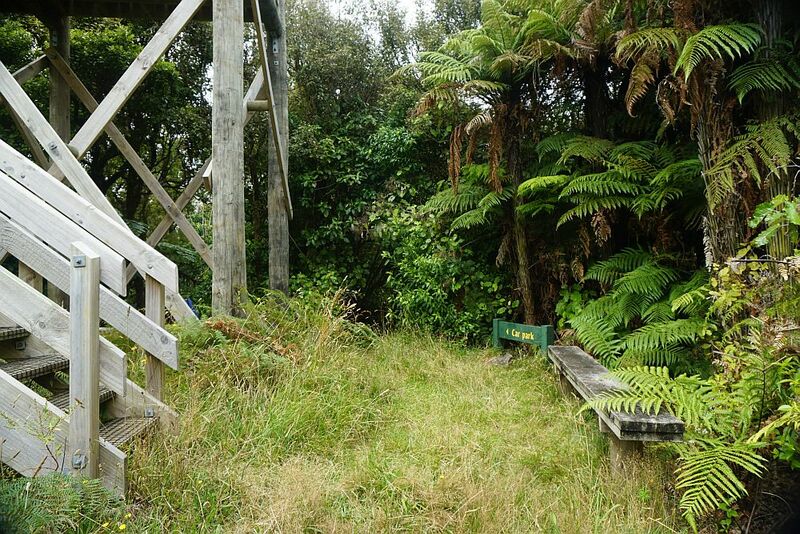 The white vehicle was a DoC vehicle, with a DoC worker, a young woman from Arizona now living in NZ, checking and setting rat traps in the reserve. 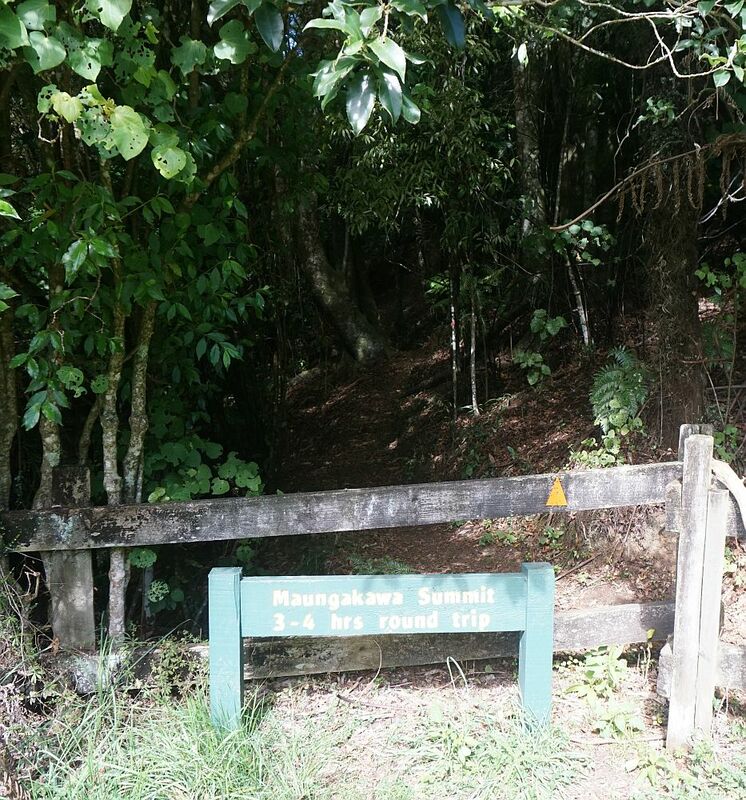 The start of the track to the summit of Maungakawa. The ends of the loop join a short distance from the carpark. 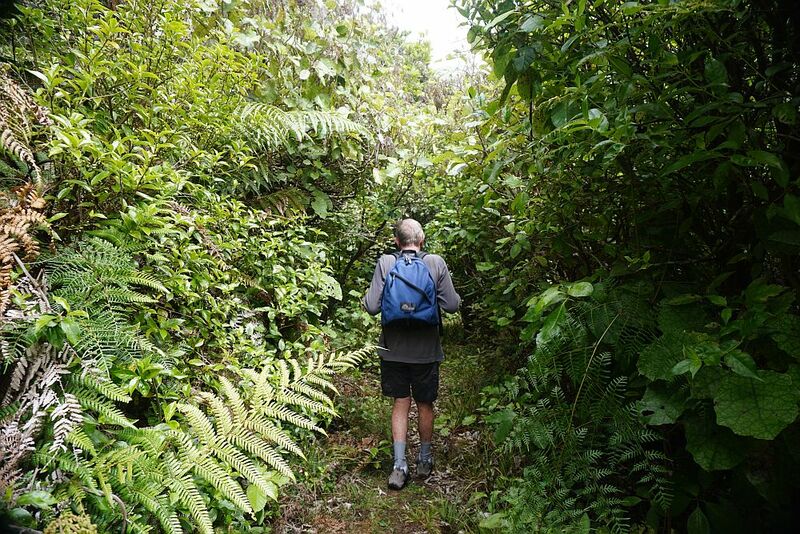 The track to the right is the most direct route to the summit, and the direction recommended by DoC. The time shown on the track to the left seems rather excessive, as the track is only slightly longer than the one to the right. A typical section of the track. It’s not obvious on the photo, but following the track is mostly easy even without referring the to the orange triangles marking the route. There were several trees along the route that had been damaged by wind. Here one trunk had fallen across the track (bottom right), and another had broken but was held up by a neighbouring tree (top left). The sign at the summit points to the carpark following the route recommended for ascending the mountain. 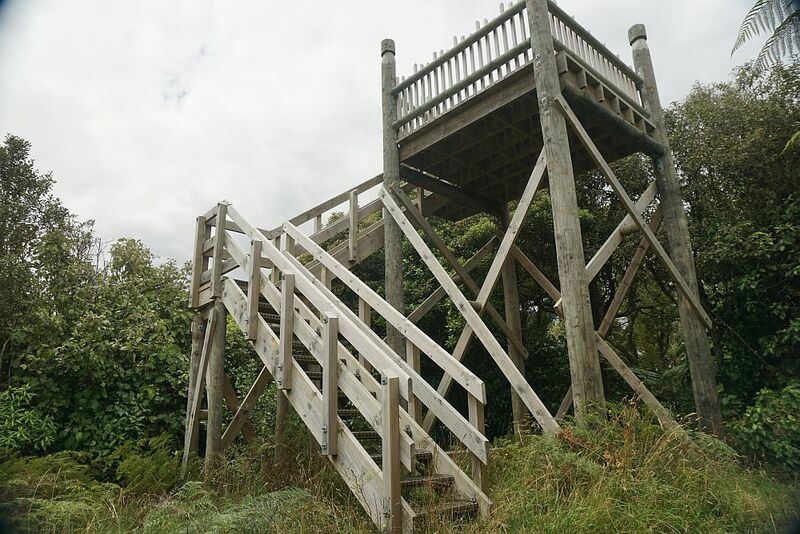 The lookout tower at the summit. 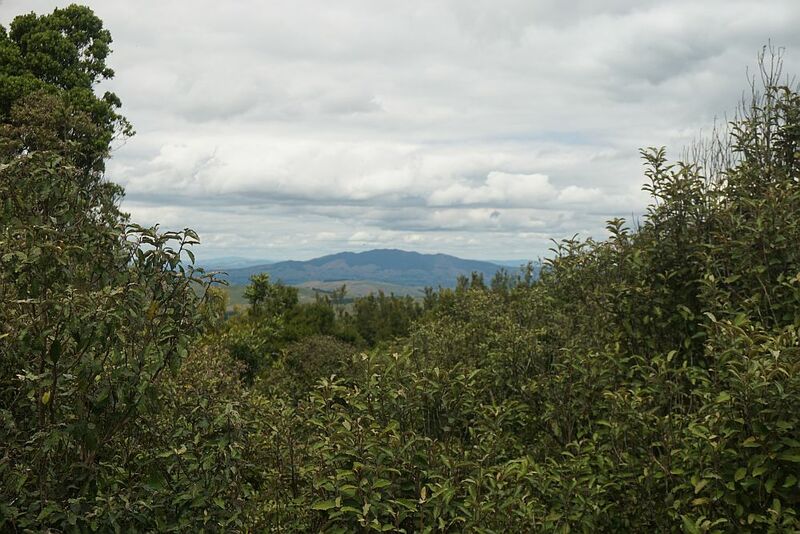 Vegetation interrupts the views in some directions, but there are still wide views mainly to the east and north. 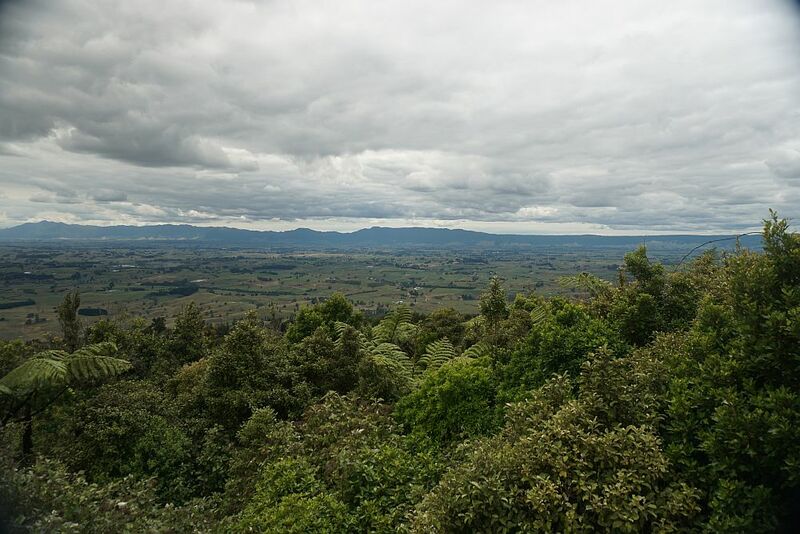 Some views from the lookout tower. 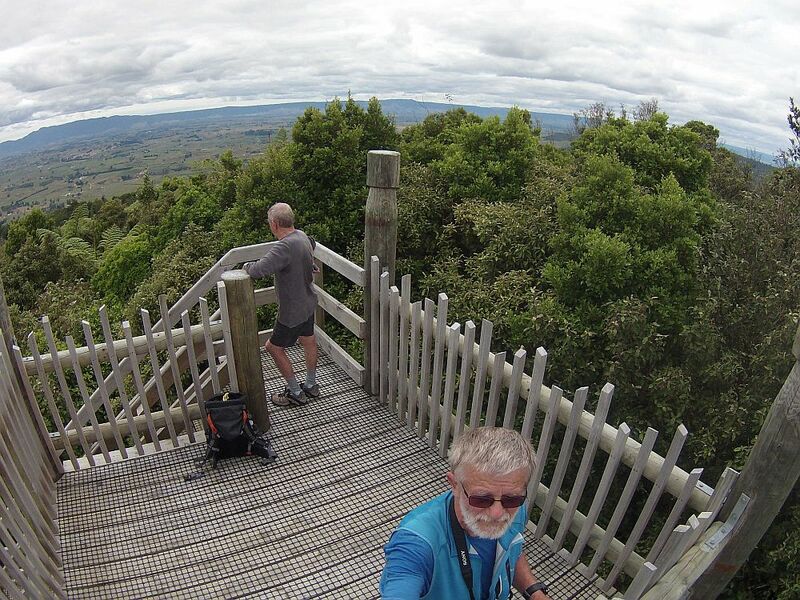 Mt Te Aroha is at the far left in the first photo. 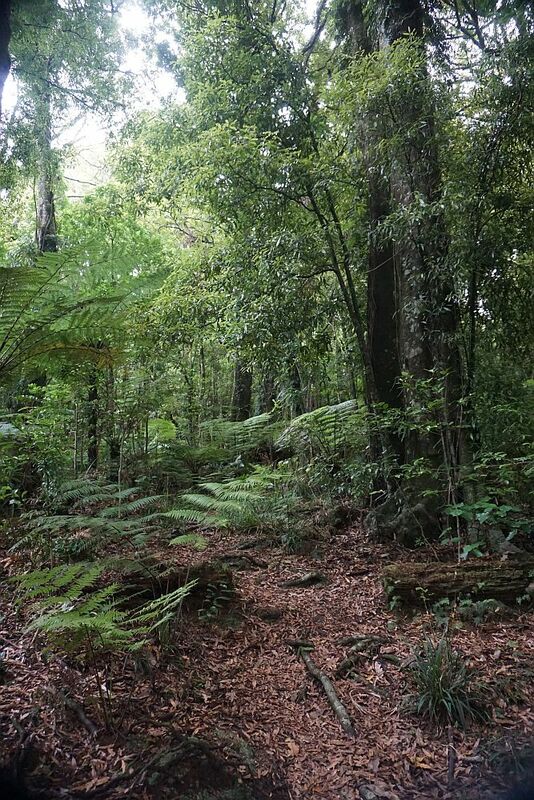 Maungatautari can be seen clearly through the vegetation. At least for the time being. 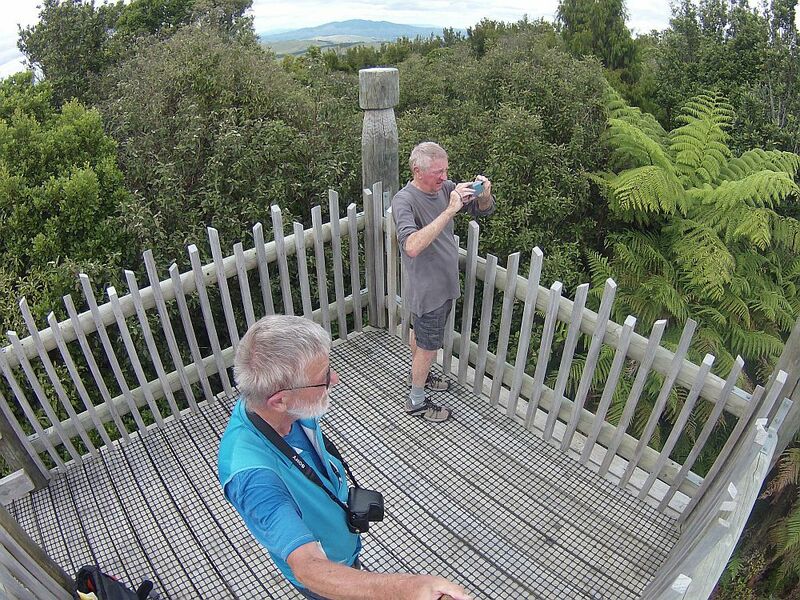 And now a few selfies and views taken on the lookout tower. 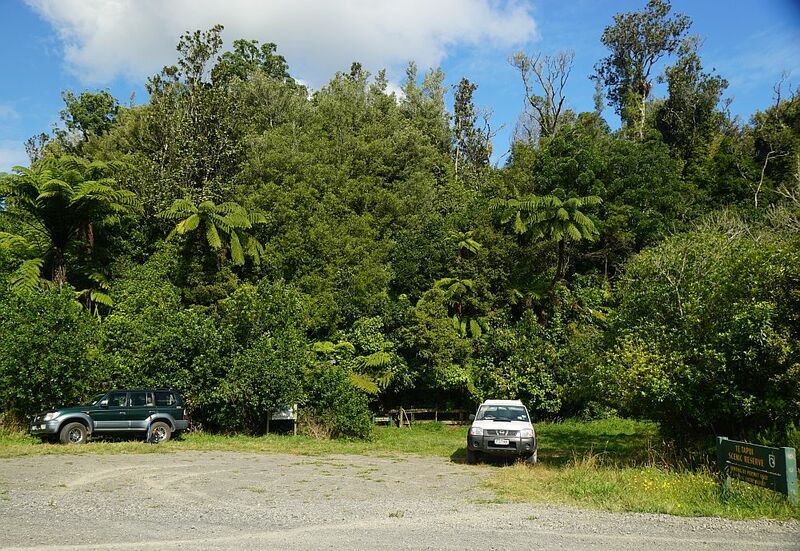 Maungatautari can be seen in the distance in the first photo. Starting the descent from the summit after enjoying a picnic lunch on the benches under the tower.. 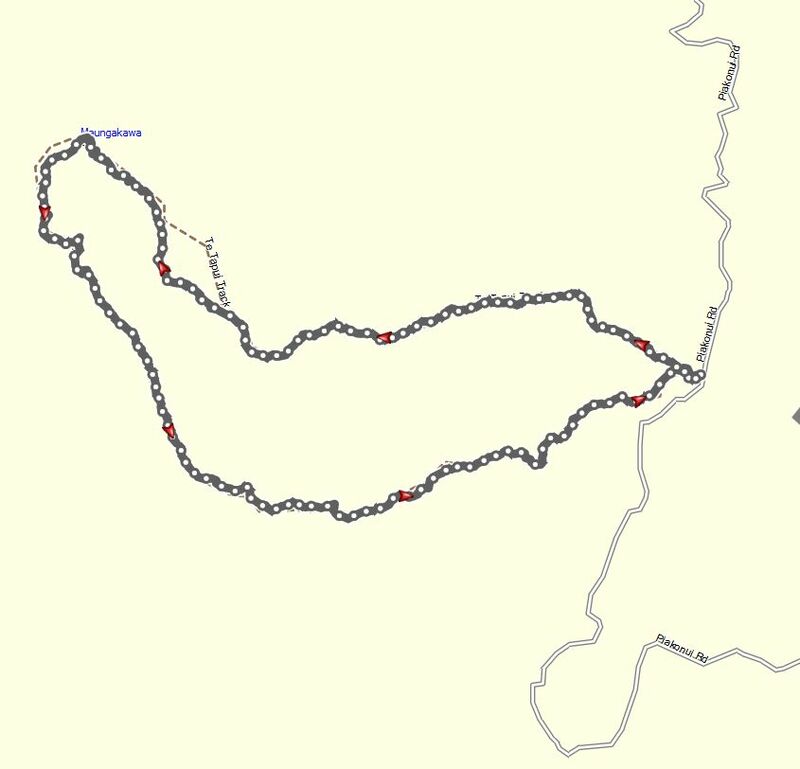 The GPS track log shows the complete loop, with the actual track not quite following the track shown on topographic maps. Total distance about 6.5km, total time about 2h 45m, including almost 30 minutes spent at the lookout tower and having lunch. The track was walked on February 12, 2015. Snow-covered Mt Ruapehu, a total of 163 km away, seen from the lookout tower on the Maungakawa summit on a clear winter’s day, July 12, 2015. The flank of Maungatautari is seen on the right. 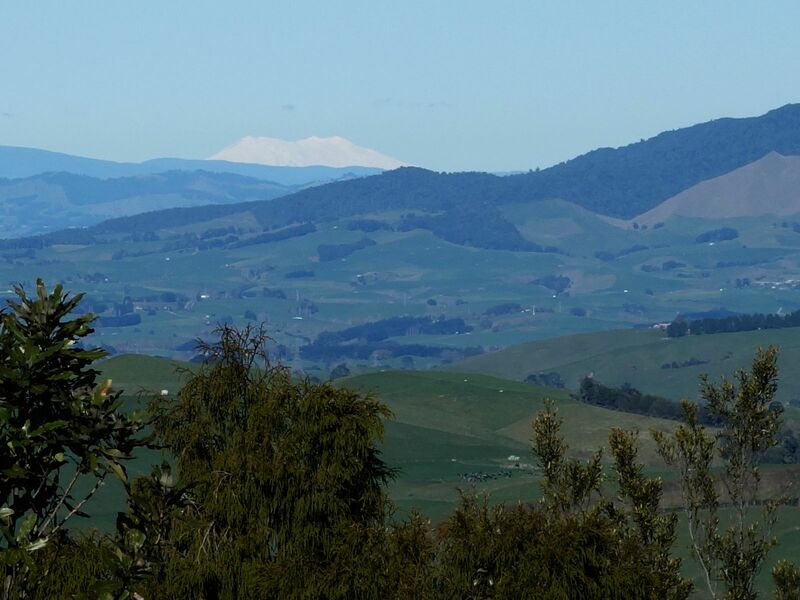 The hills in the distance in front and to the left of Ruapehu would be near Mt Pureora, about 90 km away. The track was walked again on July 12, 2015 in a clockwise direction. 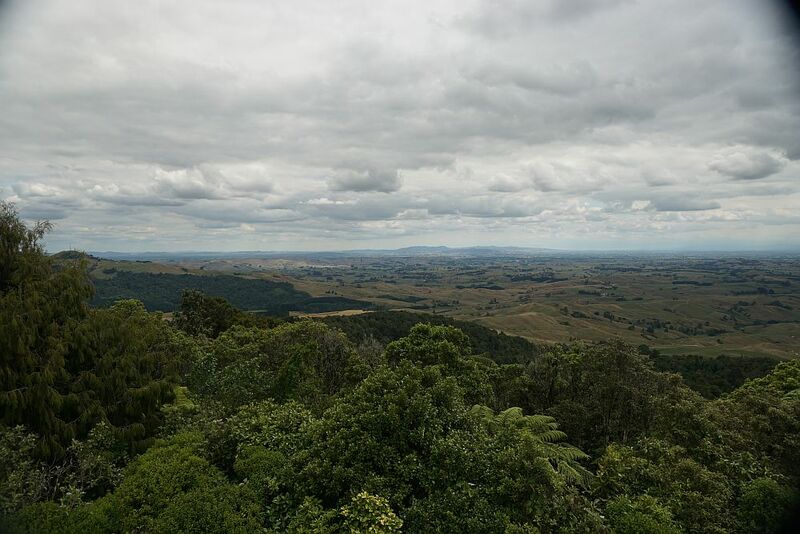 This entry was posted in Walks and tagged Cambridge, Matamata, Maungakawa, Morrinsville, Te Tapui on 2015-02-12 by nzartig. Thanks guys….love your work!! Very useful…keep it up! Thank you. It’s good to hear when people are finding the information useful.